On a board, we have several identical channels of an analog signal generation chain. A single channel consists of an AD5452, followed by ADA4807-4. We use all 4 opamps on the ADA4807 package to construct a 4th order filter at a cutoff between 150-200khz. Our DAC's are driven by an FPGA. AD5452 is in bipolar mode. It's reference voltage is 1.5V. AD4807 is driven by 1.5V and -1.5V. 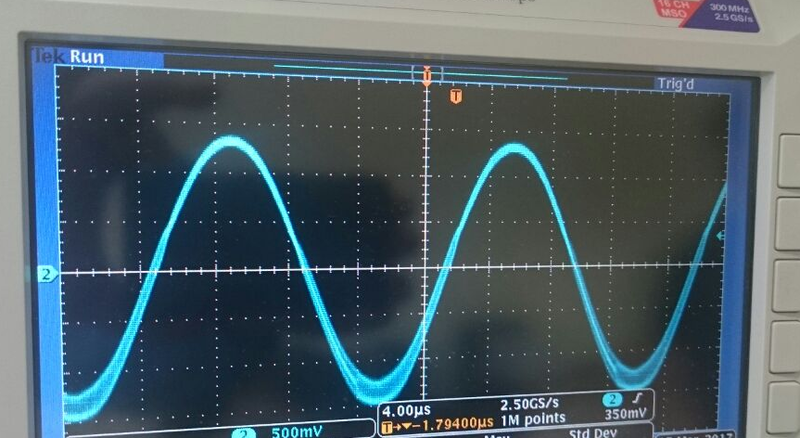 In order to test the board, we generate a sine-wave around 60khz frequency from all channels. Our SPI speed is 50MHz. For a period of a sine-wave, we generate 32 samples only. Also, we look at the output of the 3rd opamp in the above schematic, (to the left of R4), and the signal appears to be very clean at that point. Our supplies appear to be clean as well. We tried adding a small capacitor (~100pf) at the output of the last op-amp, but it made the noise worse. I emailed the filter wizard author for comments, but he is out this week. With respect to real estate problems, If you make a tiny board, but it doesn't work, then what? "we did not remove all the metal...." you will have to do a board spin before you go into production. You could also try a slower op amp: ADA4891-4, AD8618, AD8648, or ADA4084-4.